I vividly remember the first time I visited the Intu Trafford Centre. I was 9 years old and I felt as though I was in a different world, something more resembling Disney Land rather than a shopping centre. From the sheer size of the place (over 180,000m2) to the elaborate and luxurious finish, it was overwhelming as a child, and even now when I walk in via the grand stair case, I can't help but take a picture go "wow". Although a popular tourist attraction, for me, the centre is the closest and easiest place for me to shop. With free parking, over 200 stores with 1000s of brands, an incredible selection of restaurants, a cinema, bowling, mini golf and now with the latest addition of the Sea Life Centre and Legoland Discovery Centre - there really is something for all the family. It feels incredibly exciting to be working with the Intu Trafford Centre, somewhere I've been shopping for most of my life. As well as being Instagram heaven, it's also a place where I can genuinely find everything I am looking for. 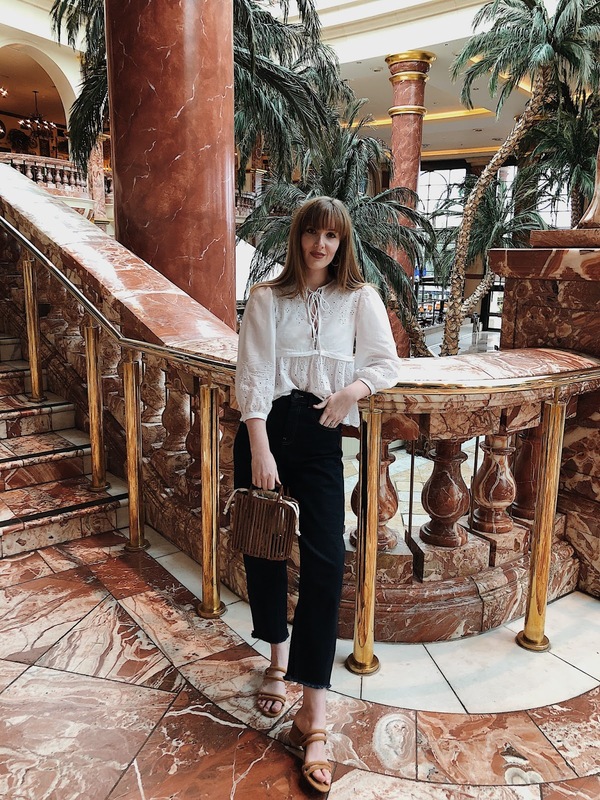 From my favourite high street stores, like Topshop and Zara, to my designer 'must haves' such as Gucci and Chloe - it's a place that you automatically think of for any outfit essentials. With their 20 year anniversary coming up, this year the centre are celebrating why they 'Stand Out' from other shopping destinations - for me it has to be the massive selection of brands, the incredible architecture (who doesn't love OTT decoration and palm trees!?) and just the entire experience of shopping somewhere, warm, safe and full of atmosphere. Last week I made one of my many monthly visits to find my top SS18 picks. I like to find key pieces that can update your wardrobe instantly, without having to make big changes and without costing the earth. I also checked out some designer investment pieces that will last much longer than a season, so let's have a look what I found! Polka Dots - Polka dots are one of the easiest trends to embrace. They are ALL OVER the high street, and I fell in love with this off the shoulder number from Pull & Bear. Super flattering for every figure; team with high waisted jeans and some trainers for an on trend outfit. The Round Bag - If you buy one accessory this season, it has to be a round bag! There are many colour and size options, but I loved this over the body small black wicker bag. Perfect for every day, and will go with any style! Oversized Denim Jacket - Denim is always on trend, but this season oversized jackets are the new must have. Worn over cute summer dresses, or for the ultimate fashionista look, go double denim! The Mule - The mule has been a big summer trend for a few years now. It's comfortable, easy to wear and there are literally hundreds of options to choose from. My new faves are these square heeled mules from Zara. Such a unique and sleek twist to a classic! Lilac - If you haven't noticed already, lilac is EVERYWHERE this SS18. It's not for everyone, but I went a little extra with this co-ord. I love the pastel hue, but if you're not keen on wearing it, then there are plenty of accessories to choose from too! Check Print - Gingham was the big hit of last summer, this year it's still around, but has evolved to incorporate all checked prints. It was love at first sight with this chic summer dress; with a flounce hem and button details, it is a dress that you can wear for every summer occasion. The Chunky Trainer - Or the 'Dad' trainer as some people call it; the marmite of footwear! I LOVE them and they were in every store I went in. My faves had to be these sleek white versions from Stradivarius. Team with a summer dress or mom jeans and a tee for casual chic. The Statement Blazer - If you follow my blog, you know I'm a BIG blazer fan. They have been on trend for the past 2/3 years, but this year the shops seem to have gone blazer crazy. I loved this gingham one, as it covers the check trend too! Circular Accessories - One of my fave trends this season. Circular accessories are all over Instagram, worn by the insta queens at the end of last year, now everyone can get their hands on the accessory of the year! This cute bucket bag with chrome handles is a great way to get into the trend! Gucci Loafer - My absolute must have when it comes to a designer investment piece has to be the Gucci loafer. For summer I love the backless versions which are slightly cheaper and have the best Spring colours! Classic Gucci Bag - I must admit to indulging in a little Gucci bag, bought from the Selfridges store a few years ago. The staff there are genuinely amazing, and they now know me, as I go in that often. They showed me the new range of classic Gucci print bags that had just arrived, including my favourite 'bee' design, perfect for Manchester Gucci lovers! Furry Loafer - Okay, I know you won't all be a fan of the furry backless loafer, but if money was no object, I'd have them in every colour! These new in velvet and gold versions are incredible, if not a little OTT! I hope you enjoyed seeing what I got up to at the Intu Trafford Centre. I genuinely found some amazing pieces, and took home a few of my faves (check out my Instagram highlights). If you're looking for an easy, relaxing way to shop, where you can find a mix of high street, designer pieces, grab a cheeky Nando's and maybe finish off with a film, then head down to one of my favourite places, you won't regret it!